Wisdom of Life. : How to live up to 100 years old? Little darling asked, "What's your dream sweetheart?" My dream now is to live up to 100 years old. That statement stunned little darling, who couldn't believe my words. I told her... many people would be just like her who won't believe that one can live up to 85 or 100. Most people think that it's almost impossible to live that long. 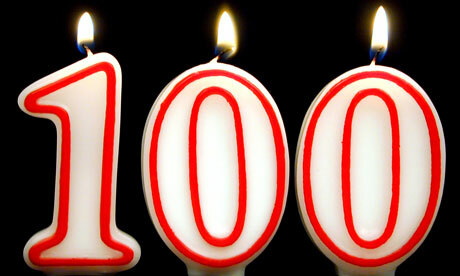 How many centenarians are on this planet? Let me tell you this true story. When I was a young man at 30, I was always very curious on palm reading and horoscope. There was a very famous astrologer in town who stationed himself in a 5 Stars Hotel. The paper was talking so much about him, and I felt that I should see him. I had to make a call through his secretary, who fixed an appointment when I had to wait for six months before I could see this great astrologer. Prior to the day, I had to provide all my personal details to her. I requested a whole life reading which costed me a few hundred bucks. On that day the intense reading took him 6 hours for him to read my so called 'faith of life', from birth to death. All the details were recorded and written on an exercise book. He indicated to me that after my reaching of 60 years old, I would be sickly and weak and my final destination of life on death is April 2013. At that time, when I was only 30 years old, the year 2013 was too far for me to look at. I thought 2013 when I would be 65 then, is good enough for me because I still have got 35 years ahead. Time flow rapidly! By the time I was 50, I realised 60 would not be too far away now. I began to feel a little uneasy because the April 2013 was really bothering me. I hope the story won't be boring to whoever are reading now. Shall I continue? If yes! Please let me know and I will relate how I overcome this prediction when I had to prove him wrong. Thanks God! Today is 23 May 2013 already. Yes, please tell us how did you overcome it! My godma's mother in law was also told that she won't live beyond 2010, but she isi stil healthy today! I supposed positive thinking help a lot... or at least, keep on thinking of something we want, and some day, some how, it will be realised. Have a nice day and a long weekend ahead! Thank God. Happy long life and sustenance to Robert Foo. your addicted readers coming back, just like television series! As you can see I found my shiny object again tonight! YES, you started the story now you MUST finish it.